and 14th at 5:30 PM. Certified Judges are required to be updated each year due to rule changes and another information to be reviewed. 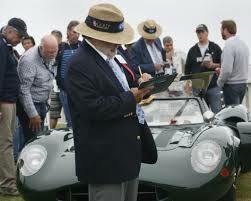 Members preparing a Jaguar for a Concours will also benefit from the information to be reviewed. Members planning to become Certified Judges are also require to attend this training. The 2019 Official JCNA Concours Rule Book will be given to each attendee. Please contact Peter Daniel at peterdvjc@yahoo.com or 540-226-7599 for more information or to make a reservation for the preferred date. See you then.